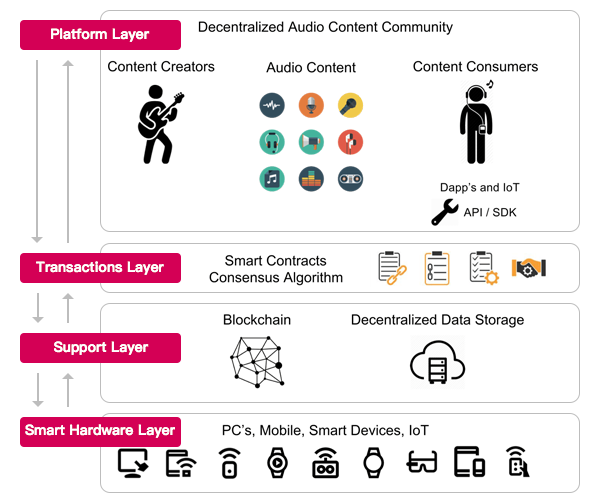 Dacc users will have full control and protection regarding content creation. Information about the copyright on the platform is posted with a note about the time of creating the right in Dacc blockchain. Algorithms implemented on the server help to detect the theft of copyright. IAM cards available for use allow participants to decide who will be able to access and use information, content or IP. Storage of information on a decentralized platform in sections and with permission cards prevents copying and theft of data. Another advantage of the platform is the approach to transactions. The right of access to creative IP and personal social data is considered as a transaction that is carried out with the permission of legitimate owners. The program allows to quickly carry out transactions and work all over the world. Smart contracts provide full platform flexibility and define individual token exchange rules for each transaction.